I sincerely hope you are having a beautiful HOLIDAY season! Below is an ODBD sneak peek of the upcoming January Release called "Baptism & Confirmation Verses". 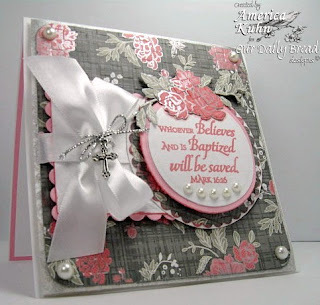 Ive created this card using this week's Mojo Sketch #119 found here..
Stamps: Our Daily Bread Designs, "Baptism/Confirmation Verses". To purchase these beautiful January releases & more wonderful ODBD sets, visit the ODBD store HERE! My kids like the one with just the pearls. :) Which version do you like better? Thanks for looking & happy creating! How can I NOT like anything you create??!! I like both but I especially love the one with the cross. WOWZER - America!!! This is simply GORGEOUS!!! Love the DP, pearls and the entire design!!! I know you will have fun with all the ODBD Sets!!! Also - *Thank you* so much for all your sweet comments :)!!! I'll be stalking you too!!! This is gorgeous!! I love how you cut out the flowers America! Love the dp and the pearls!! Such elegance my friend!! I can't choose between the two, I think they are both beautiful cards. 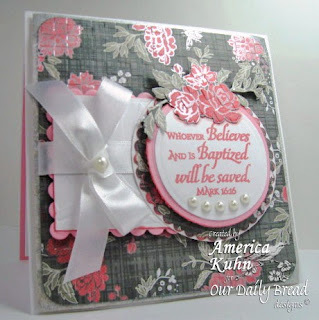 Stunning paper and the embellishments just complement it and the verse so well. Oh WOW America! Beautifully gorgeous. You've used this paper to perfection! I'm almost partial to the pearls...but they are equally stunning. I love the cut flowers and layering. Happy to be alongside you my Guest DT partner! I know you'll create more beautiful things! Seriously, this is one of the prettiest cards I have EVER seen! It really speaks to me! !